Food shops is inseparable from a festival. 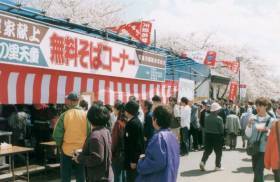 Now it is a season of cherry trees, the association of sweets did demonstration sale of sakura mochi (bean paste rice-cake wrapped in a cherry leaf). 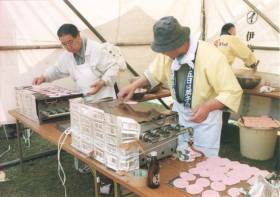 Craftsman of sweets made pink colored Sakura mochi in sequence with good skill. They sold it for "festival price", tourists bought it immediately when they displayed it at the storefront. I think that it fited very much as a food while seeing cherry blossoms because a cherry tree just became full bloom this year. And opposite them, the association of restaurant and Japanese noodle served soba (Japanese noodle) freely. It is a common usage at the "Ningen Shogi". I admire that they serve soba of several thousand meals every year. This year many people made a line, too. It is effective as a promotion of soba in Tendo, I think. 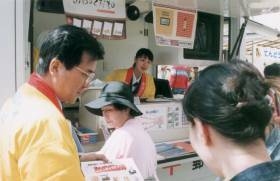 Tendo post office sold memorial postcards and stamps of "Ningen Shogi" in a movement sale car. We cannot buy them only here, only during the event. So, many tourists stopped and estimated them. I think that it bocomes an excellent collection after several years if you buy some postcards every year. Next year I will buy it, too. Previous "Shops(1)" <Please choose...> Next "Appearance"